Micrite = lime mud; CaCO3, the mineral calcite. Micrite is the equivalent of clay (rock = shale) in clastics. Originally deposited as microscopic aragonite needles, but now converted to calcite and then calcite cemented to form the rock. See Origin of Micrite for more details. Dense, uniform, fine grained rock with conchoidal fracture. This micrite has no discernable structure to it at all, and thus shows the nature of the pure rock. One note, relatively pure micrites are light gray or tan (as this specimen), but it is not uncommon for micrites to be contaminated. Which leads to the cardinal rule about sedimentary rocks - " Never trust color" when it comes to identifying sedimentary rocks. It will get you into trouble more times than not. Micrite is one of the most common carbonate rocks. 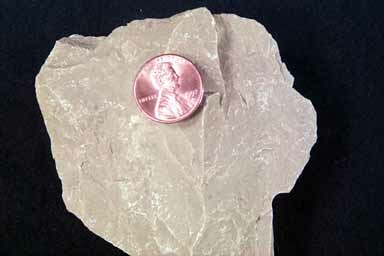 Most of what people call " limestone" is largely or exclusively micrite. As with clay (shale) it is deposited in generally quiet water, and appears in any environment where those conditions exist. This specimen could have come from a tidal lake, or a subtidal lagoon, or some similar environment.